An exclusive development of 34 apartments and penthouses designed to offer the ultimate resort lifestyle on the edge of the famous Golden Mile. 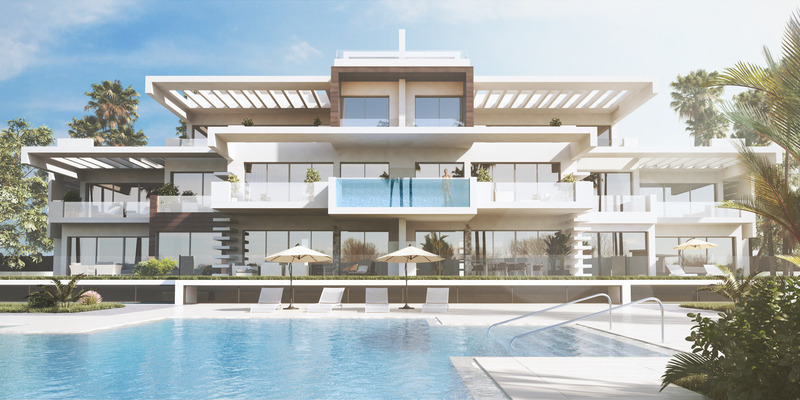 The properties go beyond offering refined modern architecture and high quality specification to also include a full range of on-site services that make this the first true luxury resort community in Marbella. Landscaped gardens surround the homes to create a private oasis walking distance from the Mediterranean. The grounds also include a 9,000m2 park reserved exclusively for residents with a 1km running track and paddle tennis courts. Panoramic sea views form the backdrop for innovatively styled properties with swimming pools, a state-of-the-art spa worthy of a grand hotel, 24-hour security and on-site concierge and property management services that mould to your needs. The exquisitely styled modern apartments and penthouses find themselves within a gated community on a gently sloping plot of 18,000m2 with open sea views. The 34 properties are distributed over four low-rise buildings surrounded by lush gardens with a pond and fountains and are bordered by a private park of 9,000m2. There is a choice of two, three and four bedroom homes and distinct interior layouts, all with a very high level of bespoke personalisation. The first floor apartments and the semi-penthouses feature a 5x3m pool, while the penthouses offer a choice of three and four bedrooms and a large solarium with 10x5m swimming pool. The homes range from 120m2 plus 35m2 terraces to 300m2 penthouses plus 380m2 of terraces. The crown jewels are the two magnificent double penthouses that occupy the top floors of two of the blocks. Advanced styling and technology are standard in a outstanding development that offers 24-hour security, paddle tennis, a private jogging track, swimming pools set in landscaped gardens, full concierge service and a deluxe resort spa that epitomises the unique lifestyle concept.